Who couldn't use a little reminder in their stressful lives to slow down and pay attention to something we often overlook? That is, how we interact with others in our communities. A new, trendy, chic piece of jewelry you can customize yourself to promote kindness is now available. String-Ring is the newest trend in interactive jewelry. Created with the hope of promoting kindness, this Kindness Reminder Ring has a very heavy 60's PEACE & LOVE feel. 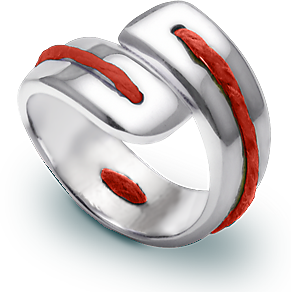 The sterling silver ring is designed to be threaded with interchangeable colored strings and is inspired by the old custom of tying a string around your finger to remember something, in this case ... kindness. Each ring comes with a set of 10 strings, each color representing a particular act of kindness. Red or Pink is the color of love and reminds us to be kind to one another. Blue represents tranquility, and should remind us to be patient with others. Purple stands for empathy and should remind us to be tolerant of the differences between us. Silver stands for wisdom and understanding and should remind us to forgive. Gold is the color of wealth and should remind us to give. Not just money but our attention, time, knowledge, or even a smile! Green reminds us to respect our environment and all other living things. Orange represents energy and enthusiasm and reminds us to laugh. Especially at ourselves! The response i've received has been inspiring, says String-Ring creator, Tina Mansfield. A cancer survivor wrote to me saying she loved the yellow reminder string. Yellow is the color of optimism and reminds her that she will get through and rise above her second bout of thyroid cancer. White was a popular color for Mother's Day, reminding busy Moms to slow down and take time for themselves. White represents peace, life and simplicity. Customers are even making their own reminders. A lady bought her niece a ring for her first communion gift and asked that the white string be used first, to remind her of her faith. I absolutely love that people are finding their own inspirational reminders in the Reminder Ring. My hope with String-Ring is to eventually expand the line with other items that promote conscious awareness. Tina explains. A couple ideas are String-Ring key chains for conscious driving to remind drivers to think and reconsider before exhibiting road rage, and String-Ring money clips to remind us to think about the products we are buying (are they environmentally friendly and were the people involved in their making paid a fair wage? ), and a String-Ring journal to encourage us to simply take responsibility for our own individual thoughts and actions, reminding ourselves that we live in busy communities and what makes those communities strongest is treating one another with respect and kindness. Tina has donated the first 100 String-Rings to The Rachel's Challenge Project. Rachel was the first victim of the Columbine school shooting in 1999 and her father, Darrell Scott, travels the globe speaking to high-school students at assemblies in the hope of promoting kindness and tolerance.